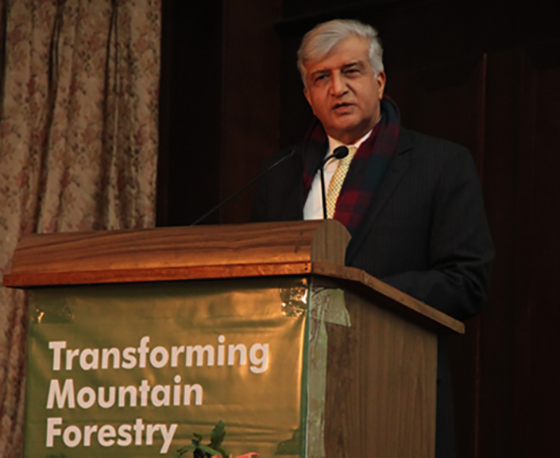 Delivering the Valedictory address at the International Symposium on Transforming Mountain Forestry Hon’ble Dr Krishan Kant Paul, the Governor of Uttarakhand, enlisted a range of ideas for the experts to consider in future deliberations. “The once highest rainfall area of Cherrapunji in Meghalaya is now bereft of forests and shrubs, challenging foresters to bring the degraded forests to life,” said His Excellency, “arguing that degraded soils do not hold healthy forests.” The scientists and foresters need to explore the causes of forest degeneration. Some of traditional practices like the ‘sacred forests’ in the tribal areas of the north-eastern India could offer cultural methods of sustaining forests, he stressed. The Hon’ble Governor also highlighted the need to conduct research on finding hydrocarbon species that can address the fossil fuel crises. By drawing patents on new discoveries of products from the forests, the scientists can make the best use of harnessing knowledge (Goddess Saraswati) to generate wealth (Goddess Lakshmi), he remarked. His Excellency said that recommendations drawn by the symposium should influence policy. Hon’ble Dr Krishan Kant Paul, the Governor of Uttarakhand addressing the gathering at the Valedictory session. Spread over 5 days in as many as 26 plenary and parallel sessions, with a couple of brain-storming sessions and few break-away group discussions, the symposium delved on a wide diversity of issues related to ‘Transforming Mountain Forestry’ towards developing a third-generation paradigm to bridge transboundary challenges for the welfare of mountain people, forests and environment in the Hindu Kush Himalayas. Governance and institutions are at the heart of a paradigm shift in managing mountain forests. Landscape-led governance institutions, on the lines of the Alpine Convention and the Mekong Commission, could be the way forward in finding common meeting points for member countries to identify policy provisions that can foster transboundary cooperation. Supporting formal and non-formal networks, encouraging legal trade in mountain products, and inter-sectorial dialogues were identified by the symposium as areas that can contribute to transboundary cooperation on wide array of issues. Developing and managing transboundary markets holds promise in the context of improving the economic basis of local livelihoods in the region. The participants unanimously agreed that ‘minimum of quality’ for mountain products could be crucial for developing a network of HKH markets. The Governments of the Countries of the HKH Region would need to work together in removing regulatory hurdles by evolving standards and maximize value realization by sticking to niche products from the mountain regions. 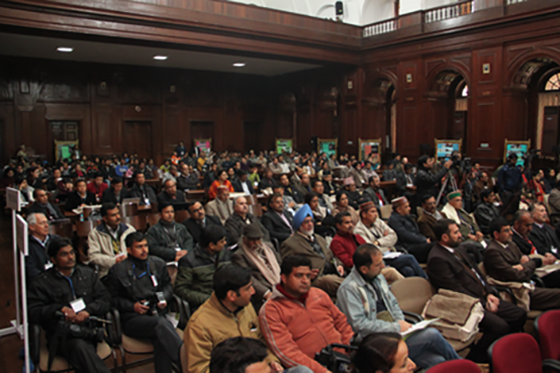 The symposium was unequivocal in voicing its concern on the growing human-wildlife conflicts. Ways to improve forest management by involving and engaging communities were out forth. Incentives to enhance stewardship of forests by communities by developing both fiscal and non-fiscal mechanisms for payment for ecosystem services were show-cased through case studies. Recognizing and mainstreaming traditional knowledge in planning and implementation could inspire local stewardship of forests.